We’re in an age of mashup-food mania, a time in which a new frankenfood unveils itself everyday. To help you keep up with all the new hypebeast snacks on the scene, we’ll be doing a weekly roundup of ridiculous mashup foods you need to know about right now, and ranking them on staying power. Read on! The mashup: We’re in state fair season, an incredibly rich period for mashups in which preposterous foods provide a punchline for news programs to end on before everyone forgets about them for another year. Fox, CBS and the U.K.’s Daily Mail were all over this three-patty, donut-bun cheeseburger when it debuted at the San Diego county fair earlier this summer. As the Daily Mail pointed out, the donut-cheeseburger is the “brainchild of grease queen Paula Deen” that has been brought to new heights (literal and figurative) by Chicken Charlie’s. 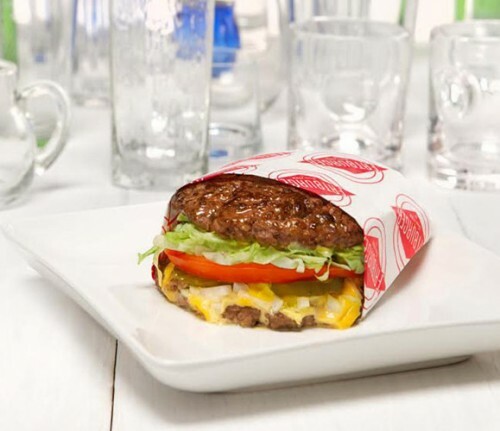 The mashup: Meanwhile, over in Beverly Hills, Fatburger has started selling a carb-free burger that uses lean beef patties in place of bread. Which sounds way more “protein-style” than In-N-Out’s off-menu burger of the same name which replaces the buns with iceberg lettuce. The mashup: In honor of the Iowa State Fair, Des Moines-based Zombie Burger has taken a classic fairground food and shoved it into a cheeseburger, because apparently cheeseburgers are everyone’s favorite item to mess with this time of year. The mashup: This is similar to The Carny, but with a Japanese schnitzel instead of a corn dog. 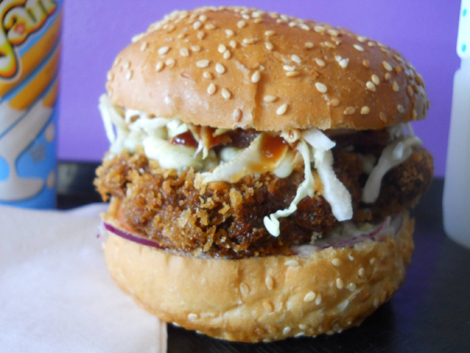 Seattle’s Katsu Burger takes beef patties, chicken cutlets, pork loins, and tofu steaks, breads and deep fries them, and then tops them with Japanese condiments like wasabi mayo, miso honey mustard, or tonkatsu sauce. And because everything is better fried, they also have a dessert of katsu dorayaki (red bean pancake) served with ice cream. The mashup: Water Street Brewery has ingeniously found a way to turn chicken and waffles into a sushi handroll, so you can walk around the Wisconsin State Fair with this in one paw and an oversized stuffed Spongebob in the other. Instead of ice cream, the rosemary cornmeal waffle cone is filled with blue cheese slaw, fried chicken, the brewery’s Honey Lager maple syrup, and their Oktoberfest beer candied bacon.